We love Sloppy Joes (and Janes) at our house. We love them slider style (which is actually easier for the kids! ), cheesesteak style, meatless style, as well as the with the store bought can and the DIY sauce. Regardless of how they are made, we love them. I find in the summer months that they are an easy go to recipe for us…the kids love them, they are a perfect dinner after an afternoon at the pool (and the kids are s.t.a.r.v.i.n.g. ), plus I can regularly find burger buns or slider/dinner rolls on sale during the summer months too! I’ll grab a few extra bags to stash into the freezer. Also, cooked sloppy joe meat freezes really well…so even if we get home from the pool at 6 pm, I can have dinner on the table 20 minutes later! 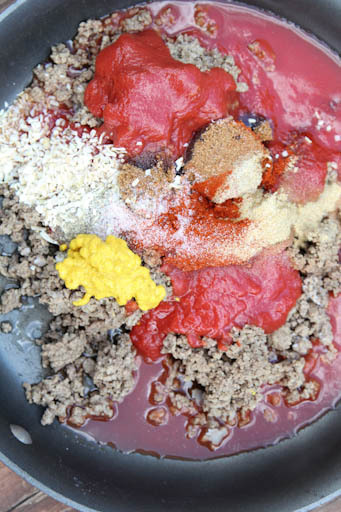 If I don’t have a can of sauce in the pantry, this is my default homemade sloppy joe mix. It’s perfectly smoky (thanks to the cumin and smoked paprika), perfectly tangy and perfectly sweet. Add onions, green peppers, red peppers, yellow peppers, or orange peppers if you have them on hand, or want to sneak in a few veggies. Check out this recipe, give it a whirl (chances are you have all the ingredients in your pantry…no need to run to the store!) and let me know what you think! In a small bowl, combine the brown sugar, minced onion, ground cumin, smoked paprika, garlic powder, salt and pepper. Brown the ground beef, then stir in the tomato sauce plus about 1/2 cans worth of water (more if you plan on simmering it a long time), the mustard and cider vinegar. Add in the spices mixture and stir into the sauce. Let simmer for 5-10 minutes, giving time for the flavors and spices to infuse into the sauce. Serve Sloppy Joes on buns (or over rice) with favorite side dishes. My family tried this recipe tonight side by side with Manwich and it was declared the winner! The only thing that I would do differently is not to add any water because I had to add some flour and let it simmer for quite a while to get it thick enough to eat on buns. Other than that, it was perfect! Made this tonight with the addition of green peppers. I didn’t have tomato sauce, so I used a small can of tomato paste and a whole can of water. It came out the perfect consistency and I will agree with another comment – better than Manwich. Never buying that stuff again. Thanks for the recipe! Erin ~ This was amazing! I was in a pinch for dinner tonight and really wanted an easy Saturday night quick-fix. My family gobbled it up! A definite go-to for a busy night or even a low key weekend night. I’ve had a few minutes to check out your boards. You have a new Pinterest Fan! 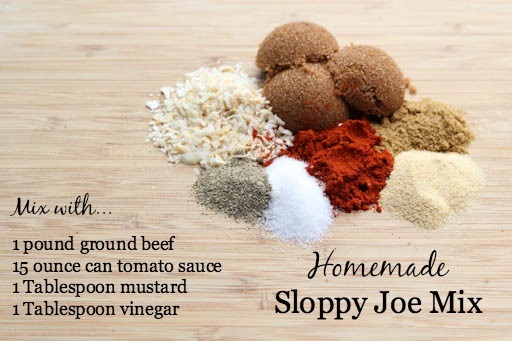 After finding an additive similar to msg in a packet of sloppy joe mix, i had to ditch it! Got sensitive to msg recently and couldn’t risk a 3 day headache. I used vegetarian “meat” with your recipe and it rocks! thanks much for a quick fix dinner! This was fantastic!! Agree with others way better than manwich! Trying to cut out unnecessary additives.Used tomato paste instead of sauce and it turned out great. Also sauted onions and garlic in with the meat. Thank you for the great recipe. I replaced the ground meat with a can of drained and rinsed black beans for my vegetarian daughter – she LOVED it! I sort of smashed some of the beans up to give it a better consistency. She says thank you!! Made this for lunch and it was a hit. Thank you so much!! Erin, I made this Sloppy Joe for our Vietnam Veteran of America meeting. The guys loved it, to say the least it was a great hit. I served it with side of Apple Cole Slaw, with chips. I used firm buns with sesame seeds on top. I will have to try it with cinnamon in the beef nest time. This was delicious! I didn’t have the usual sloppy joe mix packet, and your spice mix was better than those premade packets!!! Thank you for sharing! We really liked this recipe. My husband said it tasted better than Manwich and my daughter said it tasted just like it so it must have been good. Very easy to make. I only had regular Paprika so I used that and didn’t add in any peppers. I used onion powder, not fresh onions. Thanks for this recipe.